Electronics Curriculum and WSDOT-Pavement Guide Interactive were announced as the Premier Courseware of 2003 at the 2003 ASEE/IEEE Frontiers in Education Conference on Friday, November 7, 2003 in Boulder, CO. The Learning Modules for an Electronics Curriculum are an integrated set of courseware designed to supplement electronics instruction. Electronics Curriculum includes twenty-four interactive learning modules and utilizes two novel educational technologies (Scribe and Web Team). 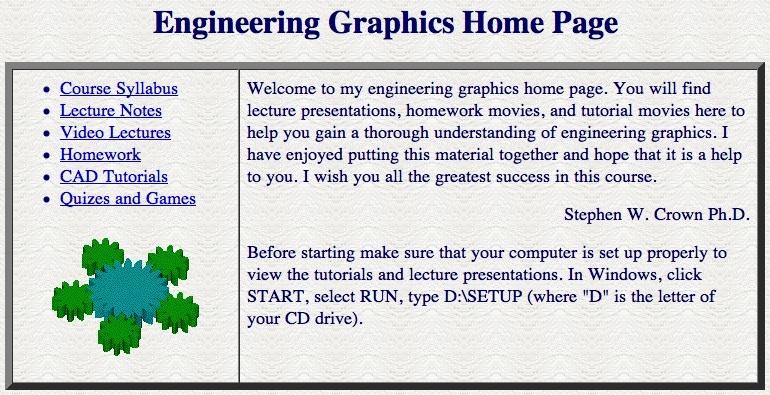 This courseware provides a comprehensive set of examples and interactive problems for introductory electronics classes that may be easily used as a set or as stand-alone modules. The key innovations of this courseware, the Scribe and Web Team technologies, greatly enhance the use of these materials as tools for students to gain understanding of basic concepts in a hands-on manner at home and in collaboration with classmates. A great strength of the approach used in Electronics Curriculum is that it augments the instructor’s ability to discern and address students’ key conceptual blocks and to monitor student performance, especially when used in the Scribe and Web Team environments. 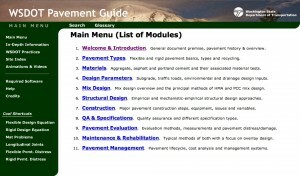 The WSDOT-Pavement Guide Interactive is a resource and information intensive site that provides an excellent self-directed instructional environment addressing pavement knowledge. While the site is self-described as a virtual “encyclopedia” of pavement knowledge, the site design transcends mere information exchange through the provision of a well-constructed instructional framework. The site’s organizational design encompasses a series of pavement related modules, each with extensive content, instructional media, in-depth resources and user self-assessment. 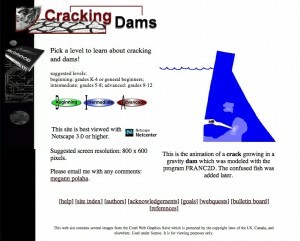 Structurally, the site is well organized, easy to navigate, and aesthetically appealing. WSDOT-Pavement Guide Interactive makes strong use of various types of media including text and graphics, video and simulation, and ensures that they are conceptually well integrated. 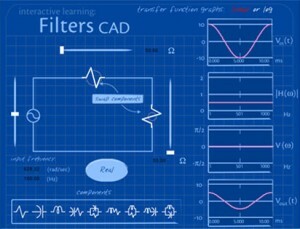 J-DSP is “labware” that enables students to perform online simulations and computer experiments in Digital Signal Processing (DSP) courses over the Internet. J-DSP provides a user-friendly graphical user interface to enable students to establish and run educational DSP simulations, such as, digital filter design, signal analysis, speech signal processing, FFT-based spectral analysis, etc. In addition, J-DSP enables applications in courses such as communications, image processing and controls. The J-DSP interface enables visual programming of DSP tasks on a Java-enabled web browser. J-DSP provides a powerful, easy-to-use, compact environment for educational simulations that complements commercially available software packages. 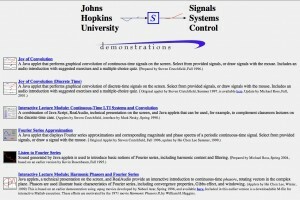 Demonstrations in Signals, Systems and Control was announced as the Premier Courseware of 2001 at the 2001 ASEE/IEEE Frontiers in Education Conference in Reno, NV. Three modules are recognized as the Premier Courseware of 2001: Joy of Convolution (Discrete Time) with Steve Crutchfield, Interactive Lecture Module: Harmonic Phasors and Fourier Series with Hsi Chen Lee, and Sense and Sensitivities with Seth Kahn. Demonstrations in Signals, Systems and Control is a set of web-based modules that supplements instruction through learning both inside and outside the engineering classroom. The website contains numerous Java applets covering a wide range of concepts in signals, systems and control. These well designed modules provide audio introductions to topics, interactive exercises and quizzes to assess learning. The modules focus on concepts that are difficult to express, such as convolution, and those that are difficult to present, such as closed loop bandwidth. Interactive simulations serve to heighten understanding and provide meaningful examples. Demonstrations in Signals, Systems and Control is easily adaptable for use in classrooms everywhere. In Hot Water merges engineering fundamentals with business analysis, providing students with a real world case study. 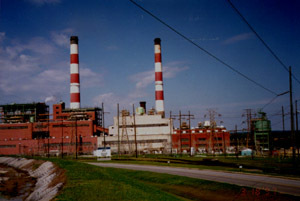 This study investigates alternatives for enhancing cooling tower performance at Plant Vogtle, a Southern Nuclear generating facility. The cooling tower performance history is presented effectively through video interviews with plant personnel and audio dialogue among key players in the decision making process. Students incorporate knowledge of such engineering topics as heat transfer, thermodynamics, fluid mechanics, and thermal systems design with business subjects such as risk management, project management and effective decision making to construct and defend proposed solutions. Ultimately, In Hot Water demonstrates how decisions, based in engineering theory, have serious financial and operational implications. Vis-MOM is a visually appealing package that presents a summary of important mechanics of materials concepts. It is particularly suited to being used by an instructor during lectures to provide concise summaries of governing equations and definitions of terms, for associating the theory with the real world situations through photographs, video clips and animations, and providing sample calculations and design problems that can be reviewed in class. The navigation and layout is relatively easy to use and students can utilize the courseware as a supplement to the lecture once it has been reviewed and concepts explained. There is good documentation for faculty who choose to adopt the package. One nice feature is the tensile test. The Virtual Car prototyping environment is a good tool to use to introduce students to the typical engineering design process. It provides students with a design problem with reasonable constraints and then assists them in developing the design from simulation through prototype fabrication. Students will likely come away from the experience having had fun while learning some important concepts in physics, mathematics and basic engineering. Students can also work in teams while building their project, allowing them to gain experience in collaborative learning. A teacher’s manual is useful to instructors attempting to use the tool in their learning environment. The manual contains a description of the learning goals and objectives and provides example assessment instruments to determine a class’s progress in attaining these. The tool introduces students to the important area of rapid prototyping and teaches them some very useful real-word skills. For example, after design, simulation, and some testing, students are encouraged and assisted in producing their own physical model of the car. They can test it against the simulation and compare the actual results with the predicted results. West Point Bridge Designer and Project Links were announced as the Premier Courseware of 2000 at the 2000 ASEE/IEEE Frontiers in Education Conference on Friday, October 20, 2000 in Kansas City, Missouri. 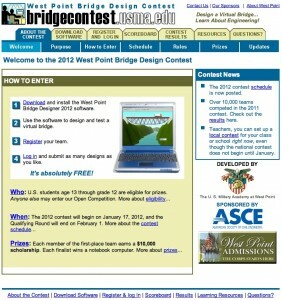 West Point Bridge Designer provides undergraduates with a tool for visualizing structural behavior and introduces middle and high school students to the engineering design process. The courseware provides an entertaining educational experience for the novice designer. A student can view a 3-D animated “load test” of their “drawing board” design, this animation allows for the visualization of the tension or compression of the structural members. 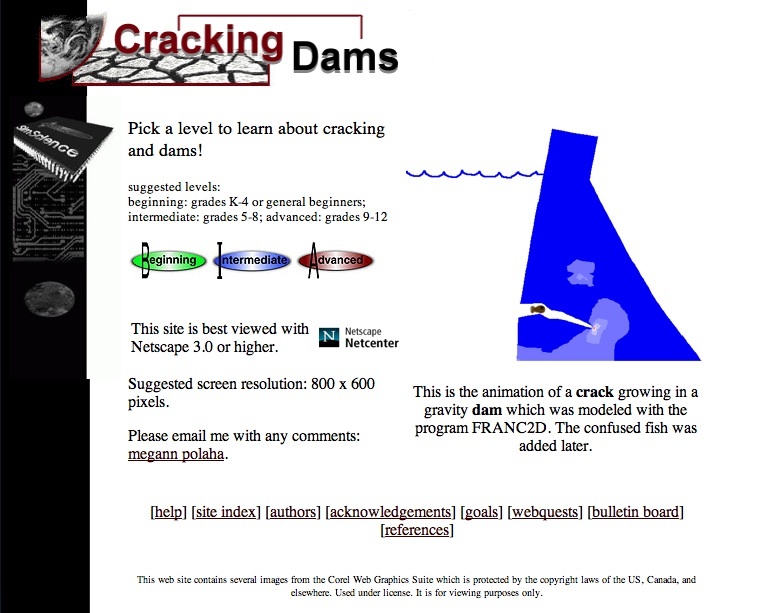 If a design fails the “load test”, the user watches the animated structure fall into the river below, but is then immediately taken back to the “drawing board” for structural analysis and improvement. For the more experienced designer, the courseware offers realistic design choices between materials and member sizes, and the very real economic tradeoffs each possesses. Five modules of Project Links are recognized: Constrained Optimization by Ashwani Kapila & Bruce Buhler; Drag Forces on Solid Objects by Howard Littman & Bernard Fleishman; Electric Potential by Kongki Min, Michael Malak, Stephen Irving & Colin Fredericks; Mass Transport by Jonathan Newell, Russell Manson, Donald Drew, Jason Hylan & Elisa Barney Smith; and Vibrating Strings by Gregor Kovacic, Robert Degeneff, Steve Braun & Billie Rinaldi. 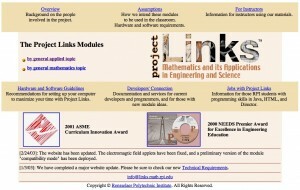 Project Links provides a comprehensive environment of learning materials that link fundamental mathematics topics to applications in engineering and science. Mathematical topics from calculus, linear algebra, probability, statistics, differential equations, discrete mathematics and advanced mathematics are included in the project. These topics are linked to relevant real-world applications in areas such as mechanical oscillations, electricity and magnetism, transport phenomena, system design and graph theory. The Project Links modules are intended to be used in a studio setting, with student access to the Internet, although the media is comprehensive enough to be used independently by students for self study. The Project Links modules help students visualize problems, improve their problem-solving skills, recall course content and develop conﬁdence in content areas. West Point Bridge Designer and Project Links were announced as the Premier Courseware of 1999 at the 1999 ASEE/IEEE Frontiers in Education Conference in San Juan, Puerto Rico.